Posh star Marcus Maddison is beaten in the aiar by Southend's Stephen Hendrie. Photo: Joe Dent/theposh.com. Welcome to Peterborough United where every silver lining has a cloud. Posh were decent last night (December 6) as they eased to within four wins of Wembley which is still quite a challenge for team who never win two matches in a row. The chairman tweeted his happiness (‘the best we’ve played for a while’), the manager was thrilled (‘a very pleasing all-round performance’) and the players left the pitch with applause from 1,700 fans ringing in their ears. Leo Da Silva Lopes is consoled by manager Grant McCann after limping off with a hamstring injury. Photo: Joe Dent/theposh.com. Naturally social media delivered the Grinch with a complaint from one tweeting twit complaining McCann slipped up by fielding too strong a side ahead of a big, tough League One game on Saturday, and that was before Leo Da Silva Lopes and Ryan Tafazolli limped off with late injuries forcing Posh to see out the final 10 minutes with nine men. Honestely Grant McCann must tear his hair out at times. He’s usually criticised for making substitutions too late. Now the accusation dealt with playing too many good players, but removing the best of them too early. The outstanding Marcus Maddison, Gwion Edwards and Jack Marriott all strolled off after 70 or so minutes tormenting a Southend side showing six changes to their winning side from last weekend. “Those who criticise me for my substitutions should come and stand in the dug out with me,” McCann stated. “It’s not easy sometimes. I was happy to get a breather into some key players, but the injuries were very badly timed. “Ryan should be okay for the next game. He’s a big tough centre half who bleeds in every game. Leo has a hamstring problem, but it’s not a pull so we will have to assess him. Posh substitute Ricky Miller shoots at the Southend goal. Photo: Joe Dent/theposh.com. It would have been a travesty if Posh had been undone by late misfortune for the second week in a row so thankfully Nile Ranger striking the bar with the goal at his mercy five minutes from the end of eight minutes added time saved Posh from a most nervy finale and McCann from the possibility of another unwanted inquest. The teams standing seventh and ninth in League One delivered an entertaining contest despite a night full of wind and cold, but without a crowd atmosphere. Posh always looked the stronger side, but Southend fashioned chances of their own, initially hitting the woodwork through a Josh Wright header when Posh were only one goal to the good. Jonathan Bond was well beaten by that attempt, but travelled most athletically across his goalline to divert a brilliant 35 yard strike from Jason Demetriou towards the end of the first-half to preserve a 16th-minute lead provided by Edwards. Posh skipper Jack Baldwin clears his lines against Southend. Photo: Joe Dent/theposh.com. Maddison assisted on that goal with a fine raking pass and Edwards returned the compliment to enable the star man to rifle home a second goal in the 62nd minute. Maddison’s right foot was in unusually good working order all night. He forced a fine save from Oxley with it before the break. 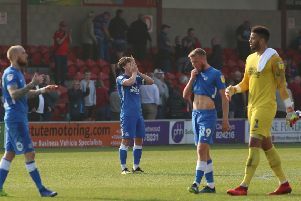 More encouragement arrived with the performances of Chris Forrester, Da Silva Lopes and Jermaine Anderson who all improved on recent efforts, as did Alex Penny whose undoubted enthusiasm at right back wasn’t accompanied last night by moments of clumsiness. Anderson should have scored after Maddison and Marriott set him up eight yards from goal, but he enjoyed his deployment further forward as did Da Silva Lopes. Marriott’s excellent second-half volley was worthy of a goal, but Oxley somehow tipped the ball onto the crossbar, while Edwards was denied twice in quick succession, first by Oxley and then by Demetriou standing on the goalline. But it was Forrester who really caught the eye. Some did wonder if the Rolls Royce last seeen at Stamford Bridge 11 months ago had been parked in the garage for good, but it was back again last night, running smoothly and looking in great working order. It wasn’t the toughest of tests mind. Free-scoring Blackburn are in town on Saturday when Posh will need everyone fit and well. Many eyes are on Wembley after this win, but for the rest of this week they will be trained firmly on the physio’s room. Posh: Jonathan Bond, Alex Penny, Andrew Hughes, Jack Baldwin, Ryan Tafazolli, Chris Forrester, Jermaine Anderson, Gwion Edwards (sub Idris Kanu, 74 mins), Marcus Maddison (sub Danny Lloyd, 77 mins), Leo Da Silva Lopes, Jack Marriott (sub Ricky Miller, 74 mins). Unused substitutes: Conor O’Malley, Michael Doughty, Sam Cartwright, Lewis Freestone. Southend: Mark Oxley, Jason Demetriou, Andton Ferdinand, John White, Stephen Hendrie, Jermaine McGlashan (sub Simon Cox, 75 mins), Josh Wright, Anthony Wordsworth (sub Stephen Mclaughlin, 65 mins), Michael Timlin, Nile Ranger, Amadou Ba (sub Theo Robinson, 61 mins). Unused substitues: Nathan Bishop, Elvis Bwomono, Dru Yearwood, Ryan Leonard. Goals: Posh - Edwards (16 mins), Maddison (63 mins).